A species is a group of organisms that can interbreed in nature to produce a fertile offspring. It is a unit of biodiversity or the degree of variation of organic life forms within a given species, ecosystem, biome, or an entire planet. Within a group of species, new biological species may arise. This is called speciation. It is the splitting from a main branch of species to form an altogether new line. 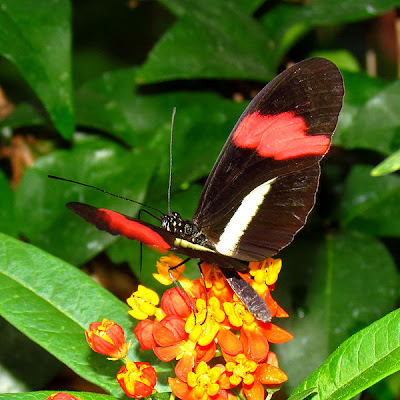 One such such species being studied and used as models for speciation are the Heliconius butterflies. Hybrid speciation has been hypothesized to occur in this genus and may contribute to the diverse mimicry found in Heliconius butterflies. The species Heliconius Heurippa is said to be a hybridized version of two Heliconius species; Heliconius Cydno and Heliconius Melpomene. Hybrid speciation is a form of speciation wherein hybridization between two different closely related species such as the two heliconius butterfiles leads to a novel species; the heliconius heurippa. This form of speciation is popular among plants but is considered extremely rare outside of the plant world. Bright black-and-red butterflies that flit across the sunlit edges of Amazonian rain forests are natural hedonists, and it does them good, according to genetic data published today in the journal Nature. An international consortium of researchers at UC Irvine and elsewhere discovered that different species of the Heliconius butterfly are crossbreeding to more quickly acquire superior wing colors. They also have a surprisingly large number of genes devoted to smell and taste. The use of color to attract mates and fend off predators is widespread in daytime-loving butterflies, while night-flying moths are famous for having large antennae to sniff out potential mates' pheromones. Thus, researchers predicted that because they're such visual creatures, the butterflies would not be able to smell or taste very well. "Instead, we learned that they have a rich repertoire of genes for olfaction [smell] and chemosensation [in this case taste]," said UCI biologist and article co-author Adriana Briscoe. Delicate antennae contain smell receptors, she explained, and the butterflies' tiny feet hold taste buds. Briscoe said additional findings by the consortium could help scientists better understand trait sharing in other species, such as Homo sapiens and Neanderthals. As part of the international effort, researchers first sequenced the genome of the Postman butterfly (Heliconius melpomene), a well-known species whose caterpillars feast on passion fruit vines in the Peruvian Amazon. They then examined the genetic makeup of two closely related species – Heliconius timareta and Heliconius elevatus – all of which sport similar color patterns on their wings to ward off predators. The genetic sharing among species, scientists believe, is the result of hybridization. Considered extremely rare, hybridization occurs when members of different species interbreed in the wild. Though often seen as an evolutionary dead end, hybrids are able to interbreed with other species, in the process introducing new genes that can help populations adapt to new or changing environments. "What we show is that one butterfly species can gain its protective color pattern genes ready-made from a different species by interbreeding with it – a much faster process than having to evolve one's color patterns from scratch," said co-author Kanchon Dasmahapatra, a postdoctoral researcher at University College London.